Professional Resume Writer - You need a great resume to get a great job! Topic: Professional Resume Writer - You need a great resume to get a great job! Most hiring managers today will make a decision about your resume in 15 to 30 seconds. Many companies now use resume scanning software, and without the right keywords, your resume may never be seen. Can your resume pass the test? I can design you a professional, technology-friendly resume for as little as $45. I'll design you a one-of-a-kind resume that highlights your unique skills and talents. I can do it online and/or by phone at a time that's convenient for you. 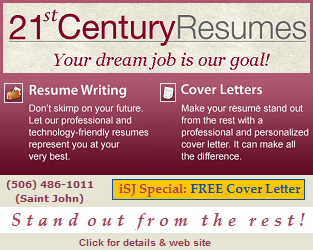 To find out what I can do to get you on the road to a new job, call me at 486-1011 or go to 21stcenturyresumes.ca.